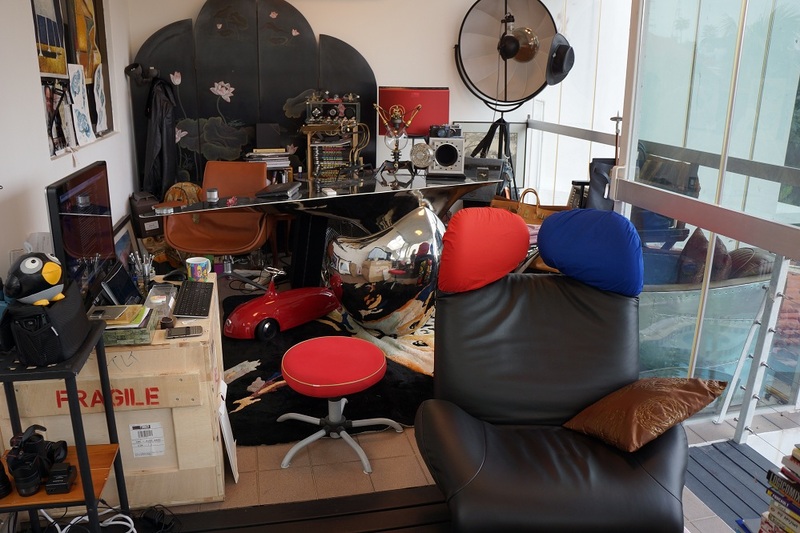 Bernard Cheong Doctor Watches Life: Designer chairs, Dottling designer safe, Leicas, 2 million bucks of watches, art, all in a room fit for a homeless person.. Designer chairs, Dottling designer safe, Leicas, 2 million bucks of watches, art, all in a room fit for a homeless person..
Till you notice that the floor is covered with leather! This room is so messy. I don't really know if this is intentional. My 2 daughters, are also equally messy...but have remarkable good taste..as in food, clothes, wines, cars...all without my or wife's direct influence. My wife, Dolly, has great taste, although she came from an extremely humble/poor family. She attended a good school in a small town. Kuantan, Malysia. She worked for Ernst & Whinney (the old name of E& Y). I think she got her tastes from Jen Shek Voon. Her boss. I know I got my taste from my mum and dad, and because of envy of my classmates in ACS. That's the good thing about going to an elite school of rich kids, back then in the 1960s. Today, it would generate a delinquent! Well..I am a sort of misfit. Although if you google me, it "may seem" that I am a society guy...and I know practically 10% of Hollywood...but I am really an ordinary guy with BAD table manners, and I wear track shoes to work 7 days a weeek...but I wear a suit in my office...out of habit and comfort. I know many doctors do not even like to wear a tie. I need to see a shrink...I really do. How does one know if they really need to see a shrink? But if, you are like me..a curious personality, then a GOOD US trained psycho analyst is more fun. I had three psych tests done on me before..curiously by the USA. These were for ranger course, LURP course and another strange one for testing my 25 year old self for "isolation" tolerances. I was silly enough in those years to sign on for full time military service...but I managed to get out before I signed, when "$$$$$" tempted me to the private sector in 1986.
nice, but, how many maids do you have - to do the cleaning, dusting, putting things back in its prper place,......? or do You totally air-con the whole place ? Totally positive airflow..down wards, with filetr. The house is also 473 feet above sea level, and in a cul de sace, surrounded by old, untouched rainforest, with a stream, crabs, etc. Very rare home, out of 8 I think, in Singapore. I bought the land back in 87 bec of the isolation. There are many more beautiful homes, but none that are as high up on this island..the highest point is 581 feet, 1 mile across from my place, but that one is reserved for green belt. I have quite a few staff...and one personal assistant.